During my first few months of training BJJ there are only a few things that really stand out in my memory. Getting crushed by absolutely everyone, my instructor weighing in at about 600lbs even though the scale said I outweighed him by 20lb and my friend Eric’s gi. 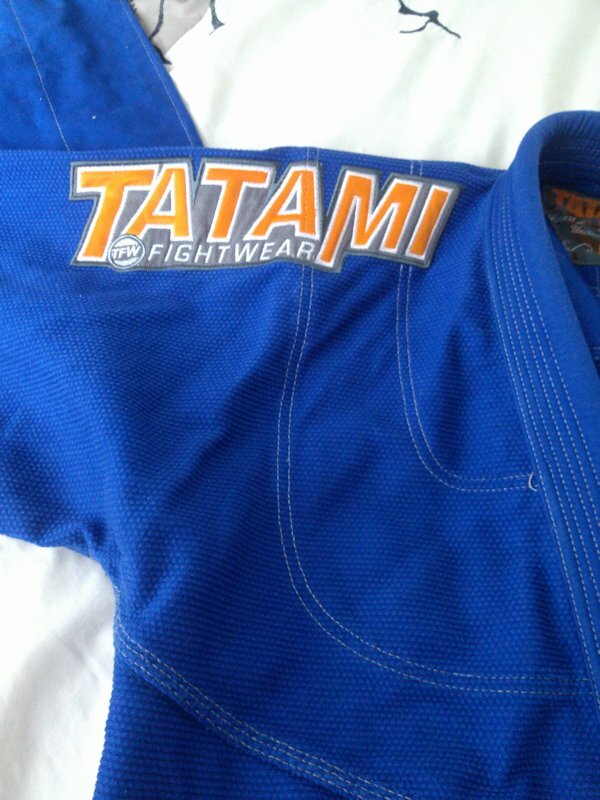 Everyone one else had these simple blue and white gis and were completely forgettable. The gi that really caught my eye was a blue Breakpoint FC Deluxe. There’s nothing subtle about the Breakpoint FC Deluxe. 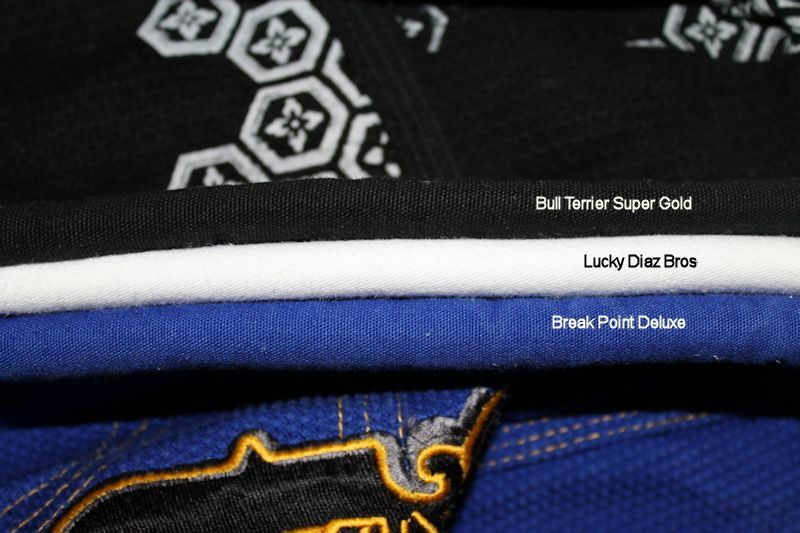 The previous iterations of the gi have made Meerkatsu’s Top Five Blingin’ BJJ gis list. The tradition of bling continues in the 2012 model and has been redesigned with a slimmer more tailored fit as well. And if you need additional incentive to read this review I’ve included a 30% off coupon code at the end of the review that is good thru Cyber Monday. The Deluxe consists of a heavy pearl weave jacket, competition style pants and also a second pair of pants that are constructed of pearl weave. The pearl weave pants are intended for heavy wear and so that you’re able to save your competition pants for when it really matters. The competition pants are constructed of 12oz cotton twill. The collar on the jacket is probably one of the thickest and stiffest that I have. The seams are reinforced with a contrast stitching and there is extra reinforcement at stress points such as the armpits and slits on the side of the skirt. Breakpoint’s bold gi really starts with the jacket. The blue gi has yellow contrast stitching throughout. 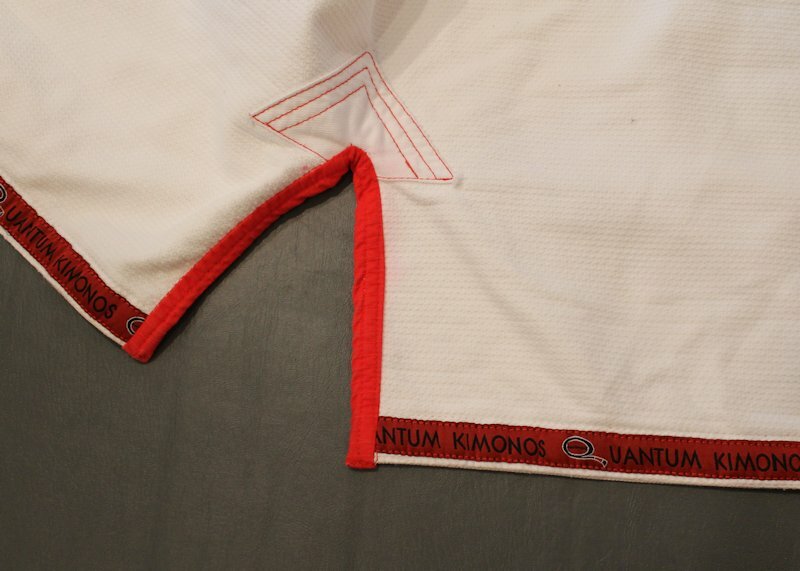 The stitching adds a very strong design element to the gi and draws the eye to it. The stitching is of consistently good quality throughout the jacket. The next feature that caught my eye is the large stylized “BP” that is embroidered on the right breast. The embroidery is roughly 6” x 6” and there is an identical one at the base of the neck. Less noticeable features on the jacket include satin tape at the base of the gi and also inside each cuff and printing directly on the inside of the jacket of Break Points “BP” logo. There are five patches on the gi. A 3” x 10.5” banner style Break Point patch is just to the side of the left lapel, another similar patch is on the back of the gi at the base of the skirt, there is the standard small identification patch at the bottom of the lapel, and finally there are patches on each shoulder. The shoulder patches consist of the stylized BP with 3 stars and measures 11” x 4”. All of the patches with the exception of the shoulder patches, they’re stitched under the collar, could be removed if needed. The training pants are constructed of pearl weave and quite a bit heavier than your typical gi pants. The pants are have a flat cloth drawstring and two belt loops. The gusset is made of the same material as the rest of the pants. For adornment the pants are quite a bit more understated than the jacket. There is a patch on the left side of upper thigh that matches the jacket’s shoulder patches and some embroidery on the bottom of the right leg. There is yellow contrast stitching and all the seams are well done. The only other decoration is satin tape on the outside of each leg that is identical to the tape at the base of the gi. The tape can also be found inside the cuffs of the pants. The patch on the pants would not be easily removed. The competition pants are styled identically to the training pants. The only differences between them are that the cut is a little different, the material and finally the competition pants are reinforced knees that begin at the upper thigh and extend down to mid-shin. Within a few moments of walking onto the mat with the new gi on I had a several people come up to me and ask me about it. As mentioned earlier this is a gi that stands out in a crowd. While drilling and rolling the gi performed well. The competition pants were very comfortable and as you’d imagine the training pants taking a little getting used to and are bit heavy and hot. The only other thing that I noticed is that the jacket did feel a little stiff. I’d imagine that this will go away after repeated use and washings. The cut is best suited towards someone whose height and weight fit into their sizing chart. For example, the A4 is suggested for athletes who are 6’2”-6”4” and weighing 220-255lb and the A4 would fit him very well. Also take into account that the gi is pre-shrunk and only the measurements only changed a little after a hot wash and dry. For another perspective check out this review of the previous year’s model here. This is a fancy gi. The patches, embroidery and stitching are all designed specifically to set it apart from other gis. The fact that it includes two pairs of pants and is priced competitively is a bonus. The Lightweight Deluxe has its own unique sense of style and you’re most likely either love it or hate it. If you’re looking for a gi with approximately 50% the bling you may want to check out their Ultra Light Standard which is <$100.00. The Deluxe gi sells for $149.95-159.95 depending on the color. Included in that price is a solid pearl weave jacket, pearl weave pants and traditional twill pants. The gi is sure to be durable and turn heads where ever you go. Breakpoint also offers other models with prices starting at less than $100. Break Points products are very competitively priced and with a little effort you can find even better deals on their clearance gear. In observance of Black Friday and CyberMonday Break Point is offering 30% for anyone who uses this coupon code: BPBLACKFRIDAY. With that coupon code you’re able to get the reviewed gi for $105-112 depending on color and their Ultralight for about $70 and that’s a damn good deal.